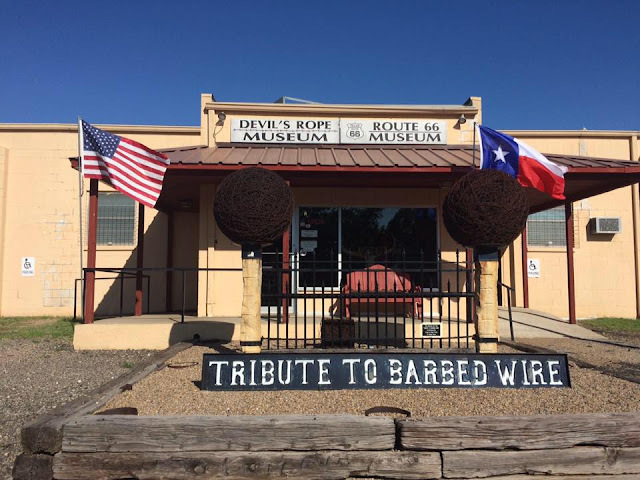 Nestled in the small town of McLean, Texas is the Devil's Rope Museum, where one can "get hooked" on collecting barbed wire. The displays throughout the museum were a collaboration by multiple barbed wire collectors when they created the museum in 1991, said museum manager Leigh Anne Isbell. "The purpose of the museum is to present and discuss ideas, come to a consensus of opinion, and publish those ideas and suggestions in an effort to continue and promote the hobby of barbed wire collecting," Isbell said. "To quote one of our original curators, 'barbed wire is an important part of history. It helped tame the West, along with windmills.'" But even today, barbed wire's presence stretches far beyond museum walls. "We like to think [barbed wire] is still relevant because it still being used around the world," Isbell said. "People are finding old wire on properties that are rare and hard to find. The wire itself holds a lot of history with its origins, how it became a household name, and the many uses for the wire itself is neat. I learned they used it for planting and telephone wire, not just for sectioning off land." Featured among countless memorabilia, and of course, barbed wire, is information about Jacob Haish. Isbell shared photos, which can be found below, of Haish's presence throughout the museum. For more information about the Devil's Rope Museum, visit their website here or their Facebook page here. Special thanks to Isbell and the museum for sharing this information.